I was first introduced to kachori when i was doing my graduation.My mom used to get samosa but never brought kachori.Gokul chaat bandar is very famous chaat bandar in koti, hyderabad.My college was just opposite to that chaat bandar.I frequently used to eat kachori ragada there and i used to love the taste,back then the cost of one plate was 4rs and now i heard it is 20 rs plate.Every time i plan to go there when ever i go to hyderabad but never i went and ate there. Once i started working we collegues used to order samosa and kachoris at the office. This is my first attempt and they came out very well but my kids removed the filling and ate the kachoris. Make a soft dough and keep it covered until use. Wash and Soak dal in water for atleast 2-3 hour. Make small puris which are thick in the center and thin around. Place the filling in the middle and bring all the corners. Press gently and avoid using rolling pin. If you try to press out using a rolling pin, the filling may come out and make holes in the kachori. 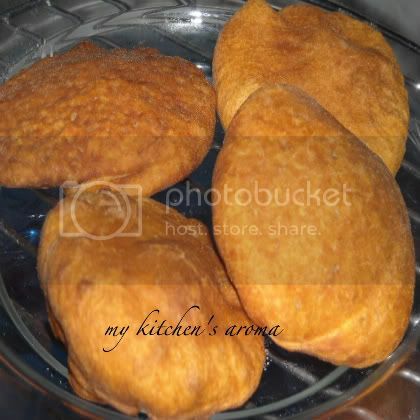 Fry the kachori's on medium low to get a crisp outer layer. This is my entry to the ICC. Wow beautifully puffed kachoris Sarita, looks great..
Kachori looks so perfect Saritha nice try iam missing icc this month also hummmm.. nice try. That's a nice snack yaa! awesome kachoris! looks so yum! delicious kachori's.Have puffed up very well. The Kachoris are looking cripsy and tasty!!! This reminds me so much of dhal puri, only the puri is rolled flat. I'll definitely give this a try. Crispy and nice color kachoris! Wow varunavi, your kachoris look fabulous..thanks for joining. Fluffy Kachoris. Looks crispy and nice. I made the moong dal one too.